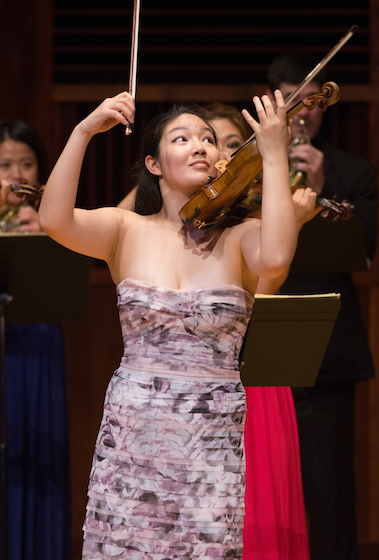 September 27, 2014, 3:00 PM · There certainly was a lot of buzz about five of the six finalists in the International Violin Competition of Indianapolis being Korean, but frankly, first-place laureate Jinjoo Cho considers herself a Clevelander. "It's where I'm from, really," Jinjoo said, speaking to me before the IVCI's closing ceremonies last Sunday at the Scottish Rite Cathedral in downtown Indianapolis. She was born in Seoul, South Korea, "and I'm proud to be Korean. But I kind of identify myself as a Clevelander." Jinjoo, who is 26, came to Cleveland 12 years ago for her violin studies, and she doesn't really feel the need to leave. "Musicians tend to love big cities, -- I guess there's work and they like to be busy," Jinjoo said. "But for me, I can't focus if there's activity around me. I need a quiet life. I don't need variety of food all the time, I don't need variety of friends all the time. I have a very close group of friends, like about four, that I hang out with all the time. I guess it has a lot to do with growing up in the suburbs in the Midwest. "(Living in Cleveland) lets me look inward, which is so important to me, personally, and musically," Jinjoo said. "I happen to love the attitude that the Midwesterners generally have towards music and the style of music that they go for. It's very humble and generous, rather than trying to be glamorous and showy. It's less about self-promotion; it's more about being selfless for the sake of music. I think it's actually the right attitude to approach music. So I'm a bit of a Midwest snob, I suppose. We haven't got a lot of those, so I'll take the torch!" 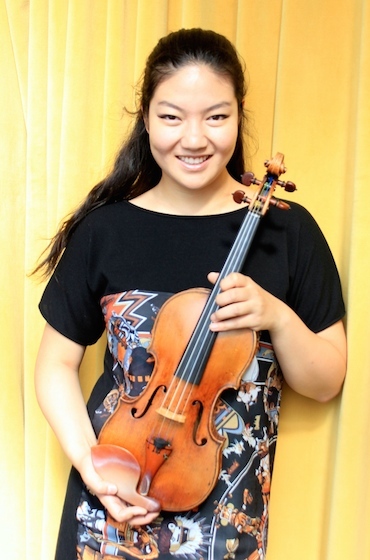 Jinjoo's big win at Indy was not her first, she also won first prize at the 2006 Montreal International Musical Competition, 2010 Buenos Aires International Violin Competition, Schoenfeld International String Competition and the 2005 Stulberg International String Competition. She earned her Bachelor and Masters of Music degrees from Cleveland Institute of Music, and attended the Curtis Institute. Her teachers have included Paul Kantor, Joseph Silverstein, Pamela Frank and Jaime Laredo. Jinjoo said that when she started playing the violin at the age of five in Korea, there was nothing particularly profound about the decision. It was just one of her activities, along with swimming and speed-skating. At the time, lot of little girls were taking violin lessons in Korea, she said, and the reason was simple: Sarah Chang. "There was a local Suzuki program in Korea, and my mom asked me if I wanted to go, because all the kids in the neighborhood were going there," Jinjoo said. "There was a huge boom after Sarah Chang and Hanna Chang -- I'm kind of the Sarah Chang kid. After she became famous, she came back to Korea to perform, and everybody started playing violin, in the same way they're picking up figure skating right now because of Yuna Kim There was a huge boom, and everybody was doing Suzuki. It was something that (parents) had fantasies about: these glamorous musicians who travel all over the world. They showed documentaries about Sarah Chang -- 'Aspen! Oh, Aspen's so beautiful.' Dami, Yoo Jin and I are sort of at the end of that boom. And I would say that Ji Yoon and Ji Young are a little bit farther away from that." Jinjoo still returns to Korea frequently. Is violin more of a thing there, than it is here? "Not necessarily. I feel like we have a good audience here and there," Jinjoo said. "I do think people study violin more intensely, from a younger age (in Korea). I think that here, in the United States, talent is such a big fantasy. 'She wants to play the violin, but if she doesn't have talent, then she can't do it. So she has to prove herself before I invest in her.' But the attitude in Korea is more like, 'I'm going to make my child talented, ' or, 'Of course she's talented, that's a given.' It's not an easy instrument for a child even to just hold. So if you're doing it, you're already talented, why are you questioning that? I think Korean parents have enormous faith in their children, especially in their early development, and they invest their everything from a very early age." So do parents push their children harder in Korea? "I can't speak for everyone because I wasn't in everyone's household," Jinjoo said. "But in my family, my mom tried hard to make me practice. It was more about work ethic and owning up to what you're given to do, rather than the violin itself. It was about trying your best and doing the best you can, whatever you do. It's hard to balance, and some people fail and some people succeed. Who knows the right way to bring up a child, there's no answer. But I know for a fact that, once I decided that this was going to be my life. my family did everything they could to help me. Even in the moments when I said, 'I want this, but I don't want to practice' -- we all do that. And a lot of parents say, 'If you don't want to do it then you don't have to do it.' But the question is, are they rejecting the goal, or the momentary work? It's kind of like doing homework: nobody wants to do homework, but everybody wants to do well in school. I don't know any single child who doesn't want to do well -- they might be hiding it, but they all want to do well at something." Jinjoo's longest-term teacher was Paul Kantor, whom she met at Aspen in 2000 and studied with until 2012. "I had a lesson with him, and it was love at first lesson!" she said. "It was just very instant. I knew, within five minutes, that I was going to be his student. I'm a bonafide PK child." Of course, that means different things to different people, because Kantor is highly adaptable to different learners, she said. "You hear a story about Mr. Kantor in a lesson from a different person, it doesn't sound anything like the Mr. Kantor I know. He is able to pull out many different sides of the human being in himself to get the best in us, and to (help us) approach music in a very sincere way. It's all about sincerity with him, and just playing from your heart." Jinjoo also has studied for two years with Jaime Laredo at the Cleveland Institute. "He knows when to stop saying things,' she said, "he catches it right away when I'm getting too much in my head. 'Stop, and just play,' he says. And that's been so helpful for me." For the Indianapolis competition, she, like all the other competitors, had to prepare a long list of repertoire. For her it was: the Grave and Fuga from Sonata No. 2 by Bach; Sonata K. 304 by Mozart; Caprices 4 and 11 by Paganini; Berceuse in D by Fauré; Sonata No. 1 in D major, Op. 12 by Beethoven; Fantasy for Solo Violin by Ellen Taaffe Zwilich; Sonata No. 1 in F minor by Prokofiev; Carmen Fantasy by Waxman; Violin Concerto No. 5 by Mozart; and Violin Concerto by Korngold. "Probably Prokofiev F minor -- that's such a unique piece of music," Jinjoo said. "No other violin sonata is like it. It's different even from other Prokofiev pieces -- very dark, twisted, but at the same time, there is a certain kind of tortured beauty in it, and I think it speaks to the essence of what it means to be human." "Once you've hit mid-20s, you kind of figure out how to practice for you," she said. "It's not really a system that's adjusted to the competition, but it's a system that you apply to yourself, in preparing for anything. I know what my weaknesses are, and my strengths. So you kind of balance them, and that's a big part of the process. I actually didn't have that much time to prepare this time because I spent the summer doing a chamber music festival. Most of it, except for the Korngold, it's the rep I've played many times before." She'd only performed the Korngold once before the competition, and with music. But she liked the idea of playing something that was a little bit different. "It's like movie music, and I love movie music, especially the old Hollywood movie music," she said. In the future, she'd like to keep performing as much as possible, and also to continue exploring her new passion for chamber music. "I'm more in love with it now than ever," she said of chamber music. "I wasn't one of those born-to-be-chamber-musicians, but recently, with exposure and experience, I've been getting to the core value of it." If you wish to hear Jinjoo Cho's performances at the IVCI, here is a link to the archived performances of Jinjoo, and of all the contestants. October 1, 2014 at 02:07 AM · I, can remember Jinjoo´s 2006 Montreal final, she played Shostakowich 1, at begining the orchestra stop, conductor big mistake, a lot of "AHHHH" later she restart a glorious perfomance, only few person believe that she can win, but at last, in the middle of controversy, she was the winner. In Indianapolis 2014 i loved her performance.